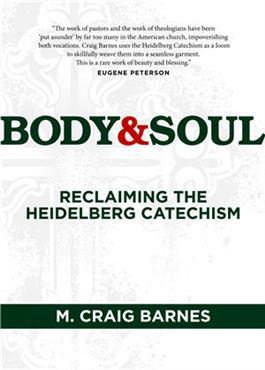 In this groundbreaking book, theologian, pastor, and popular author M. Craig Barnes reveals the Heidelberg Catechism's true identity. It's not a list of doctrinal questions and answers. It'snot a cut-and-dried summary of what Christians believe. It's a deeply personal statement of faith and a surprisingly contemporary guide for everyday life. Body & Soul is based on the latest ecumenical translation of the Heidelberg Catechism approved by the CRC, the PC(USA) and the RCA. Additional resources include a companion DVD (sold separately) featuring video introductions by M.Craig Barnes for use in a six-session study. The event kit (sold separately) provides resources for using Body & Soul as the basis of a six-week all-church study. "The work of pastors and the work of theologians have been 'put asunder' by far too many in the American church, impoverishing both vocations. Craig Barnes uses the Heidelberg Catechism as a loom to skillfully weave them into a seamless garment. This is a rare work of beauty and blessing." "Craig Barnes is one of the most thoughtful and engaging minds around. Body & Soul will be a feast for your heart and mind. (And it doesn't cost an arm and a leg.)" "I can think of no one better than Craig Barnes to introduce the Heidelberg Catechism to contemporary Christians. The Catechism is a gift to the church, and so is Barnes' clear and illuminating book. Seekers, newcomers, and old hands in the church all will benefit from his thoughtful reflections." "To engage a catechism is to enter into a holy conversation. Craig Barnes brings insights as a pastor and church historian to the new translation of the Heidelberg. I encourage you to use his study guide to begin your own sacred dialogue." "The beauty of the Heidelberg Catechism and the clarity of Craig Barnes' teaching bring the Good News into high definition. Treat yourself to this book, and then share the joy!" M. Craig Barnes is a pastor, a professor, and president of Princeton Theological Seminary. He is the author of several books, including "Yearning," "When God Interrupts," "Hustling God," and "Sacred Thirst."